A true work-to-weekend staple, this blousy top features a ties at the neck which can be left undone for a relaxed look or tied for a polished feel. Made in NYC. Loose, relaxed fit. Length hits at hip and can be worn both tucked and untucked. Our model is 5’10” and wearing a size S. Runs slightly small; if you are in-between sizes, we recommend sizing up in this style. 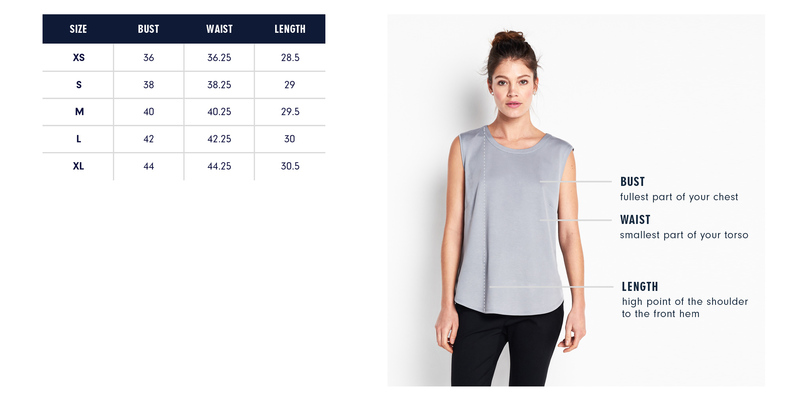 Below are the exact measurements of the Chrystie Top. All measurements are in inches. For general brand fit, sizing, and measurements, please visit our Brand Fit & Size Guide. Machine was warm; line dry. Do not tumble dry. Dry cleanable. Loose, relaxed fit. Length hits at hip and can be worn both tucked and untucked. For a fabric like silk, roominess in the sleeve is crucial for ease of movement. I added subtle gathering at the cuff for a relaxed, comfortable fit without adding too much volume. Features: Button cuff with slight ruching allows for a relaxed fit through the arm.